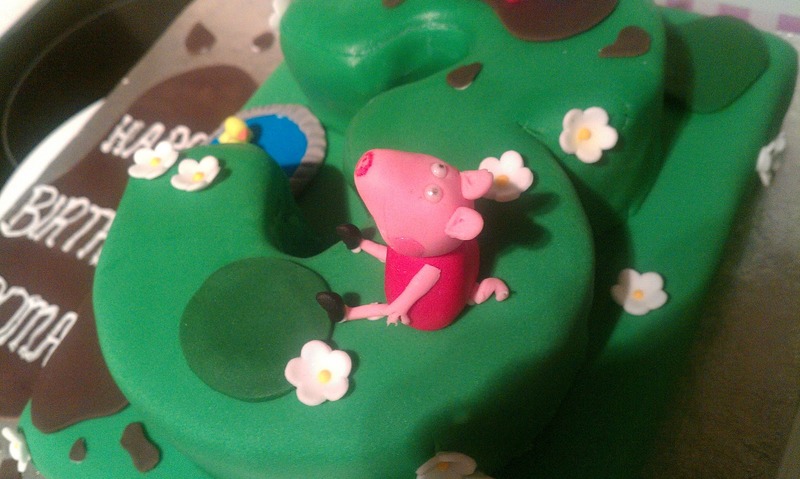 Hooray I got to get back to some novelty caking with this one. 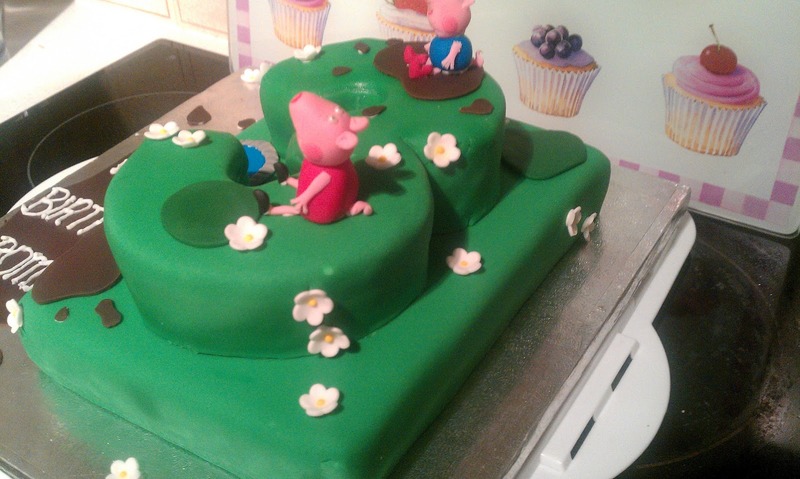 A cake I made for a lady at work, for her Grandaughter's 3rd birthday. It was quite time intensive, but I think it was worth the end result. There are a few bits I would certainly like to have improved and would like to work on. But overall a hit! I made two large rectangular vanilla victoria sandwich type sponges. Cut the edges off of one to get a really neat rectangle. The second one I cut into a 3. They were then covered with a thin layer of buttercream, which was smoothed to within an inch of it's life! I made the edges as sharp as I could possibly manage. I don't think I have ever spent so much time on buttercream! But I can tell you, it was well worth it! I left these in sealed containers overnight for the buttercream to get a bit more solid and form a good foundation over which to lay the fondant. I started out by covering both of the sponges separately with a layer of rolled out green fondant. 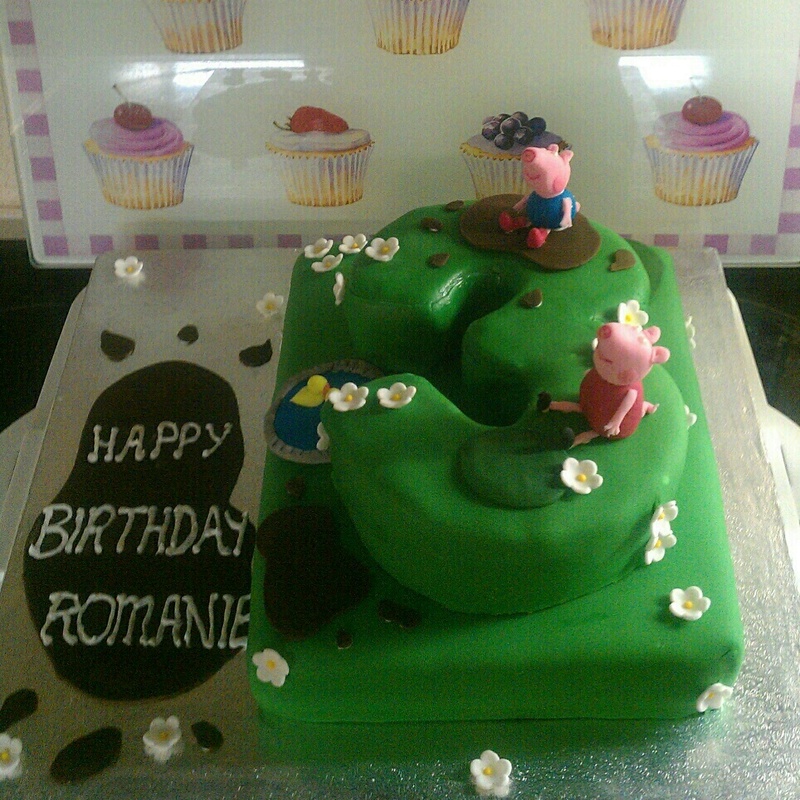 This took a little while to get right, as I had to cut extra strips and patch together the fondant around the 3 quite a bit, but again, it was well worth taking the extra time and care for a better end result. And the bits where it went really wrong and I failed to rescue ... 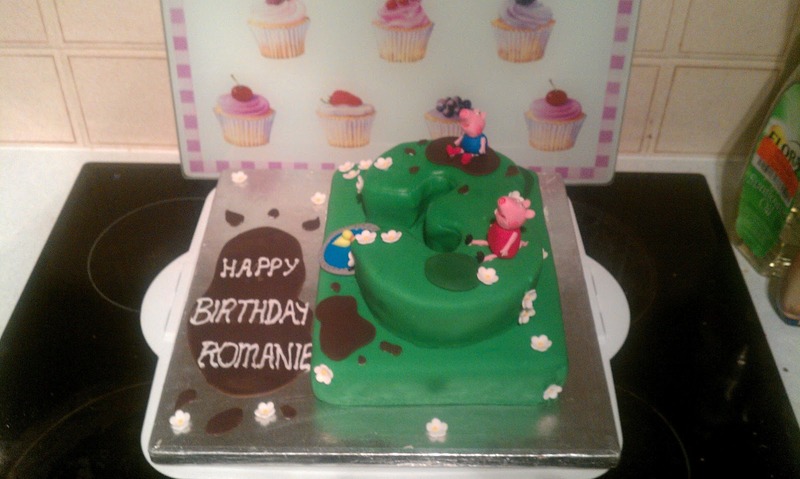 I covered with decorative sugar flowers and fondant mud puddles etc! 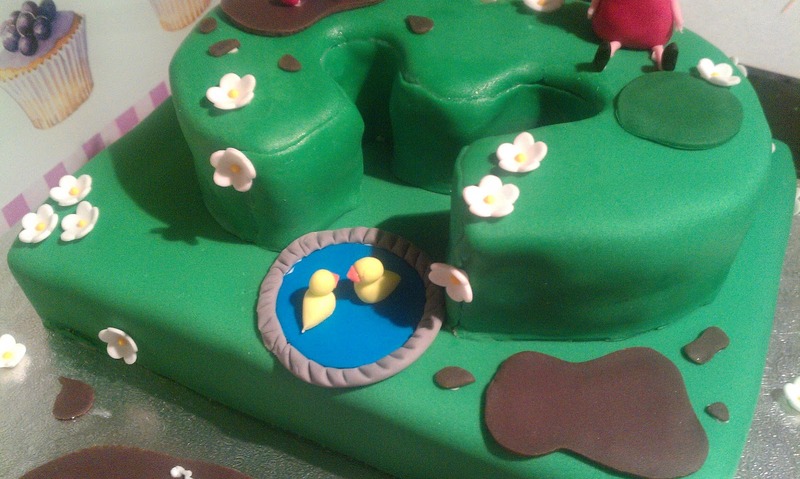 The flowers were bought ready made in a small packet, but the remaining decorations (mud puddles, lake and ducks, Peppa and George) were all made with fondant, rolled and cut or moulded into shape. I attached everything using royal icing, and iced the lettering of the birthday message in the same. I have had some really lovely compliments for this one, and I am quite proud of it. 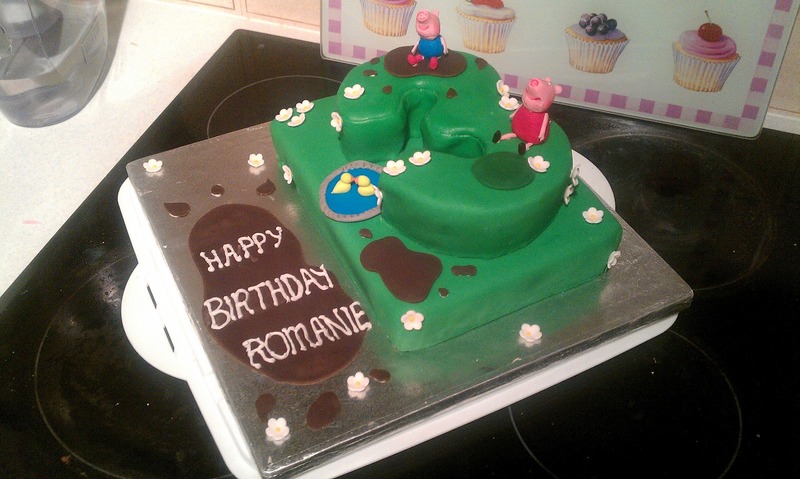 It was really nice to have a good excuse to make a good novelty cake! 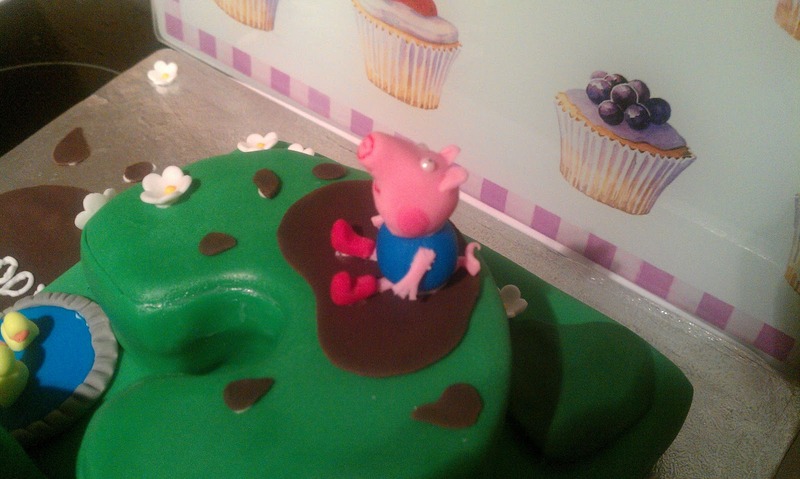 and I am looking forward to my next cake creating adventure now.